As a share of total operating expenses, the cost of labor was nearly equal to fuel expenses in 2014. 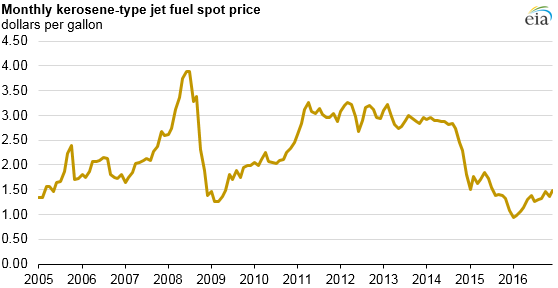 Fuel costs decreased significantly in 2015 as jet fuel prices declined. Many airlines hedge their fuel expenses by locking in fuel prices as insurance against the volatile nature of fuel prices; however, these fuel hedging efforts likely declined as fuel prices trended downward. Recent increases in airlines’ net profits have likely lessened capital constraints on efforts to modernize commercial fleets through purchases or leases of new, more fuel-efficient aircraft. During periods of rapidly increasing jet fuel prices, airlines are also motivated to introduce cost-saving measures, such as increasing the efficiency of their operations and fleets. Operational changes such as increasing flight load factors (i.e., reducing the number of empty seats) and changing the routes and speeds flown can also increase fuel efficiency. According to the International Council on Clean Transportation, global commercial aircraft average fuel efficiency (measured as fuel consumed per passenger-mile) for new aircraft improved 1.3% per year on average from 1968 through 2014. Aircraft fuel efficiency varies based on aircraft range, size, and operation economics (e.g., seating capacity). New aircraft, whether they are acquired to expand capacity or replace existing capacity, are significantly more efficient than the average aircraft in the existing commercial fleet. For this reason, policies that may encourage more turnover of the existing fleet, including policies that affect aircraft emissions and noise standards, can accelerate improvement in fleet-wide efficiency.